Daytrader have announced that they have joined the Rise Records family! Congratulations to the group. 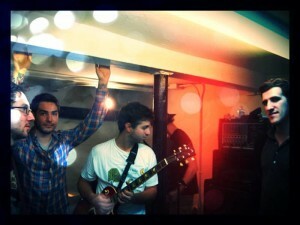 They are looking to begin the recording process with producer Mike Sapone (Brand New, Taking Back Sunday), in preparation for a spring 2012 release. On top of all this great news, Daytrader recently recruited Scotty Giffin (formerly of Crime In Stereo) on drums as well as Matt Mascarenas, from Reviver, on the bass. “So, after talking to a bunch of different labels, we’ve decided to sign with Rise Records. These guys have been talking to us since we released our first songs just over a year ago, and after exploring our options to make our first album, it was obvious they were the right people to make it with. In fact this is one of the only indie labels that wouldn’t restrict the kind of songs we put on our album, what producers we work with, who does the artwork(daniel danger, by the way), etc. We’re excited to make the first daytrader album the way we want to make it with people who really believe in our music and our way of doing things. 2012 will be crazy. The producer we’re working with for this first album is Mike Sapone. He’s done some of our favorite hometown records… taking back sunday, brand new and the like. He’s also worked with Gary (guitarist) and our new drummer Scotty in the past. We’ve been working most of the year writing new songs, we have a bunch demo’d, about seventeen songs written so far. No filler on this one. Speaking of which, we’ve finally solidified a rhythm section for daytrader. Scotty Giffin (Crime in Stereo) who we’ve known/toured with for years is joining us on the drums and Matt Mascarenas (Reviver) is holding down the bass. These are two of our favorite people and some of the most talented musicians we know. Very excited to play our first shows with them in the coming weeks.